Forty-five DII football champions have been crowned since Louisiana Tech defeated Western Kentucky 34-0 in the first DII Football Championship in 1973. Several of those early champions went on to find success in both the FBS and FCS. North Dakota State, Montana State and Delaware, for example, went on to win FCS championships. Altogether four DII national champions have made a move to the FBS while nine have gone on to the FCS. It's not simply some of the teams that have changed, but the tournament itself. Since the first DII playoffs were played in 1973, more and more teams have entered the mix. What started as an eight-team tournament increased to 16 teams in 1988, then 24 teams in 2004, until it reached its current 28-team format in 2016. It's that much harder to win a national championship now then it has ever been. 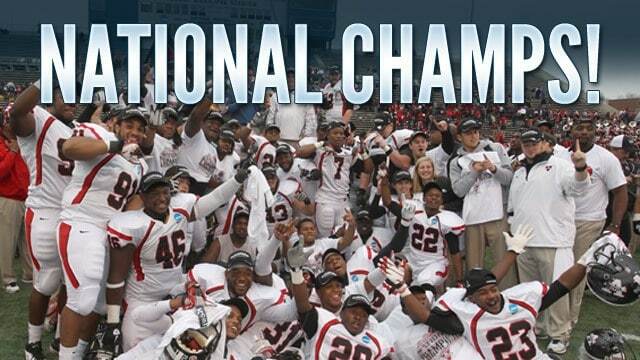 Let's take a look at the programs who have won the most DII football titles. 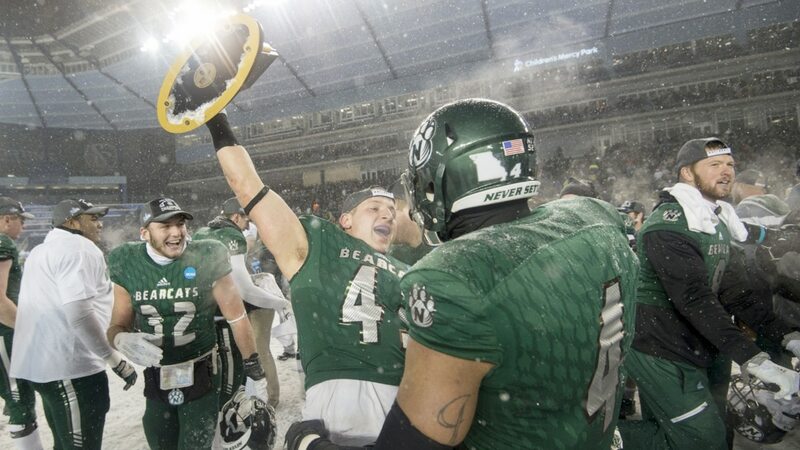 Simply put, the Bearcats are the DII football powerhouse. A perennial threat to both the Mid-America Intercollegiate Athletics Association and the national title, their coaches, teams, and trophies are the stuff legends are made of. The Bearcats history really begins when legendary DII coach Mel Tjeersdma led Northwest Missouri State to back-to-back titles in 1998 and 1999. The 1998 squad was the first DII football program to go 15-0 in a season, but they would do it again, most memorably in back-to-back seasons between 2015 and 2016. Ten years later, Tjeersdma became just the second DII football coach to tally three titles, the most all-time (fellow Bearcats head coach Adam Dorrell would shortly join him as the third). In between the 1999 and 2009 championships, Northwest Missouri State was still in the hunt, losing four straight national championship games between 2005-08. All said, the Bearcats have appeared in 50 percent of the national championship games during the past two decades. That is utter dominance. GoBison.com North Dakota State defeated North Alabama in the 1985 championship game. Before becoming the dynasty that's won six of the last seven FCS titles, the Bison were a dynasty in DII football. North Dakota State went to four consecutive championship games in the early 1980s, losing by one point to Chan Gailey-led Troy while winning three. Earle Solomonson coached the Bison to back-to-back championships in 1985 and '86, his only two years at the helm. Solomonson started his coaching career with a 2-2 record in 1985, but finished with a 22-0-1 run to those two titles. Not a bad run at all. The Lakers were the DII football team to beat in the first decade of the 2000s. From 2001 to 2009, Grand Valley State appeared in six national championship games, winning four of them, including back-to-backers over Northwest Missouri State in 2005 and 2006. The Bearcats got their revenge in 2009, but we are all looking forward to the day these two powerhouses meet again in the finals. Sprinkled in between the Bearcats and Lakers dominance were the Blazers. Valdosta State has been a playoff regular since the calendar flipped to the 2000s, appearing in 12 tournaments already in the young stages of this century. Now, head coach Kerwin Bell has the current Blazers looking like those powerhouses of old. He led them back to championship glory in 2018 in a 49-47 victory over Ferris State that set the standard for DII football championship game records. From 1986 to 2013, Florence, Alabama was home to the DII Football Championship, a longer streak than any other host city in the history of the game. It is also home to the Lions. North Alabama was able to use that home field advantage, as the legendary Bobby Wallace led the Lions to three-straight titles in the 1990s, making Wallace the first DII football coach to win three championships. The Lions reached the title game one last time in 2016 before an injury-plagued 2017 ended their tenure in DII football. Now an FCS team, the Lions still have plenty of old DII foes on their schedule. 2017 Texas A&M-Commerce Colby Carthel 37-27 West Florida Kansas City, Kan.
2016 Northwest Missouri State Adam Dorrel 29-3 North Alabama Kansas City, Kan.
2015 Northwest Missouri State Adam Dorrel 34-7 Shepherd Kansas City, Kan.
2014 Colorado State-Pueblo John Wristen 13-0 Minnesota State-Mankato Kansas City, Kan.
2013 Northwest Missouri State Adam Dorrel 43-28 Lenoir-Rhyne Florence, Ala.
2012 Valdosta State David Dean 35-7 Winston-Salem State Florence, Ala.
2011 Pittsburg State Tim Beck 35-21 Wayne State (Mich.) Florence, Ala.
2010 Minnesota-Duluth Bob Nielson 20-17 Delta State Florence, Ala.
2009 Northwest Missouri State Mel Tjeersdma 30-23 Grand Valley State Florence, Ala.
2008 Minnesota-Duluth Bob Nielson 21-14 Northwest Missouri State Florence, Ala.
2007 Valdosta State David Dean 25-20 Northwest Missouri State Florence, Ala.
2006 Grand Valley State Chuck Martin 17-14 Northwest Missouri State Florence, Ala.
2005 Grand Valley State Chuck Martin 21-17 Northwest Missouri State Florence, Ala.
2004 Valdosta State Christ Hatcher 36-31 Pittsburg State Florence, Ala.
2003 Grand Valley State Brian Kelly 10-3 North Dakota Florence, Ala.
2002 Grand Valley State Brian Kelly 31-24 Valdosta State Florence, Ala.
2001 North Dakota Dale Lennon 17-14 Grand Valley State Florence, Ala.
2000 Delta State Steve Campbell 63-34 Bloomsburg Florence, Ala.
1999 Northwest Missouri State Mel Tjeersdma 58-52 (4ot) Carson-Newman Florence, Ala.
1998 Northwest Missouri State Mel Tjeersdma 24-6 Carson-Newman Florence, Ala.
1997 Northern Colorado Joe Glenn 51-0 New Haven Florence, Ala.
1996 Northern Colorado Joe Glenn 23-14 Carson-Newman Florence, Ala.
1995 North Alabama Bobby Wallace 27-7 Pittsburg State Florence, Ala.
1994 North Alabama Bobby Wallace 16-10 Texas A&M-Kingsville Florence, Ala.
1993 North Alabama Bobby Wallace 41-34 Indiana (Pa.) Florence, Ala.
1992 Jacksonville State Bill Burgess 17-13 Pittsburg State Florence, Ala.
1991 Pittsburg State Chuck Broyles 23-6 Jacksonville State Florence, Ala.
1990 North Dakota State Rocky Hager 51-11 Indiana (Pa.) Florence, Ala.
1989 *Mississippi College John Williams 3-0 Jacksonville State Florence, Ala.
1988 North Dakota State Rocky Hager 35-21 Portland State Florence, Ala.
1987 Troy Rick Rhoades 31-17 Portland State Florence, Ala.
1986 North Dakota State Earle Solomonson 27-7 South Dakota Florence, Ala.
1980 Cal Poly Joe Harper 21-13 Eastern Illinois Albuquerque, N.M.
1979 Delaware Tubby Raymond 38-21 Youngstown State Albuquerque, N.M.
1975 Northern Michigan Gil Krueger 16-14 Western Kentucky Sacramento, Calif.
1974 Central Michigan Roy Kramer 54-14 Delaware Sacramento, Calif.
1973 Louisiana Tech Maxie Lambright 34-0 Western Kentucky Sacramento, Calif.